Gearing up for a long ride? Great, let’s take inventory. Something to carry them in? Well, unless you’ve got pockets the size of grocery bags, you’re going to need a handlebar bag. If you’ve been looking for the best handlebar bag for touring, I'm here to help. Here are my top three choices. If you don't have time to read my guide, then check out the Ibe﻿﻿﻿ra all-weather handlebar bag. Its average size and modest cost make it a good middle-of-the-road option, and the waterproof cover and map case are a must for long tours. Roswheel is a relatively new company based in China. Their sole focus is producing bicycle bags of all kinds. If you associate Chinese goods with mass production and cheap quality, you may want to give the Roswheel 11491 a chance to prove itself. They employ a small number of designers and skilled craftsmen to create a full line of high-quality bike accessories. 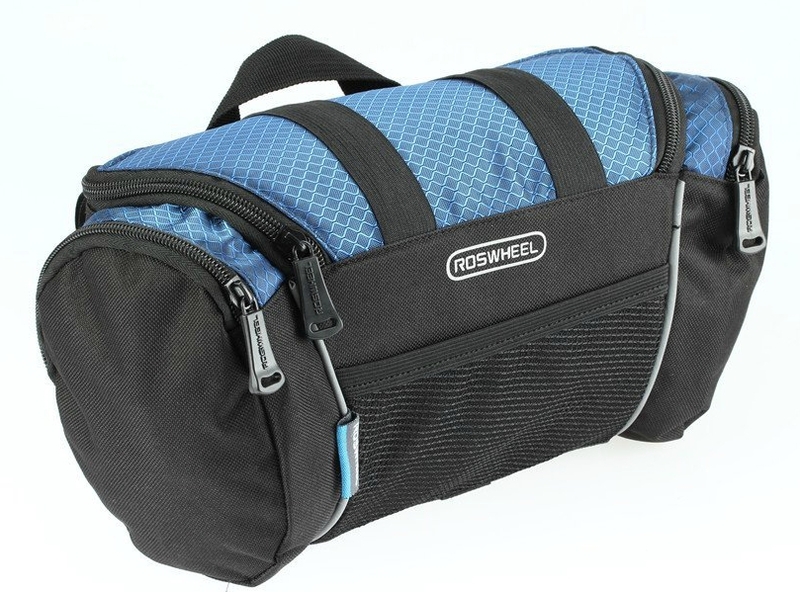 The Roswheel 11491 measures 32x17x11 cm and features a dual-tone polyester cover in black and sky-blue. Its three-point Velcro design ensures a snug fit on most kinds of bikes, including both mountain and road. 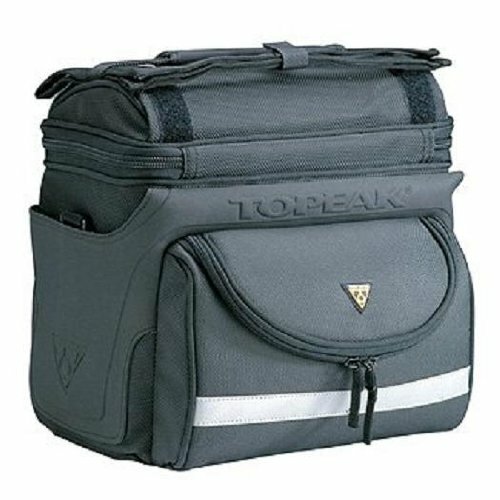 The main compartment keeps your items secure with a u-shaped polyethylene lining. On either side of the bag you’ll find additional zipper compartments for smaller items like your phone or wallet. This is a good all-around bag for cyclists who just need a little more carrying capacity than a saddle bag and like the in-ride accessibility of handlebar bags versus panniers. A bone of contention with this bag seems to be the way it fits the handlebars. Some users claim a perfect, snug fit while others complain that the strap length and Velcro placement creates a loose, wobbly feeling. It’s true this is an inexpensive bag, so don’t expect top-notch performance without some kind of tradeoff. Although Roswheel claims it fits all bicycle types, you should strap it to your own bike first, if possible, before you buy it. Our next selection comes from Ibera, a company dedicated to the cycling life. Their niche is innovative products for recreational, commuting, and touring cyclists, with an emphasis on comfort and ease of use. 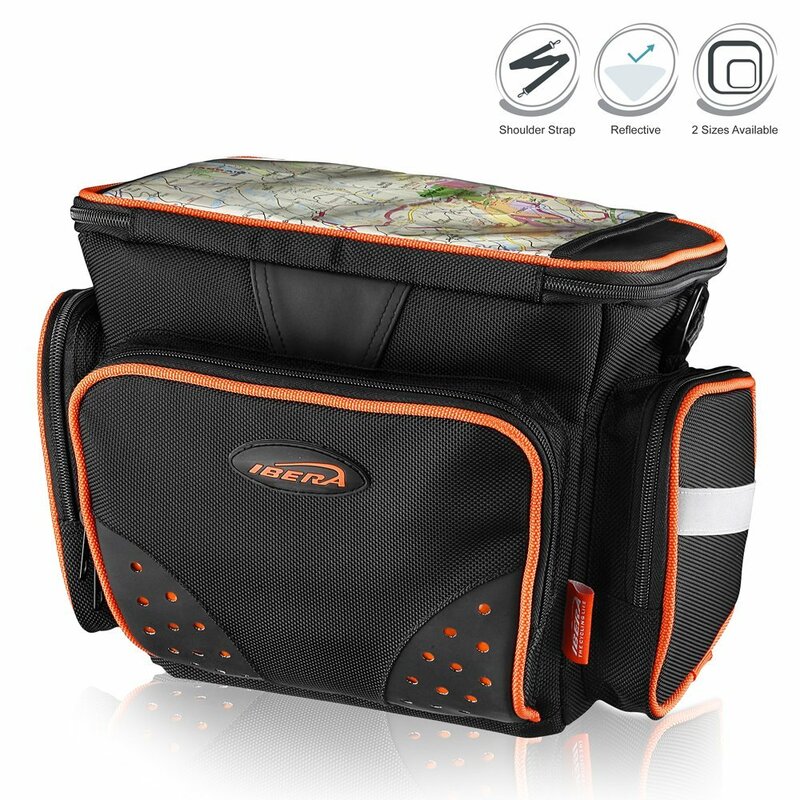 Ibera’s All-Weather Handlebar Bag is on the larger side, measuring roughly 28x20x18 cm. Ibera markets this specifically as a bag for camera equipment and gear, with a padded interior and padded dividers. Rather than Velcro straps, Ibera has opted for size-adjustable clamps that ensure a custom fit on most handlebars. The waterproof exterior is a high-contrast black and orange with some reflective striping on the sides. On top, you’ll find a clear sleeve that can hold maps or a phone. 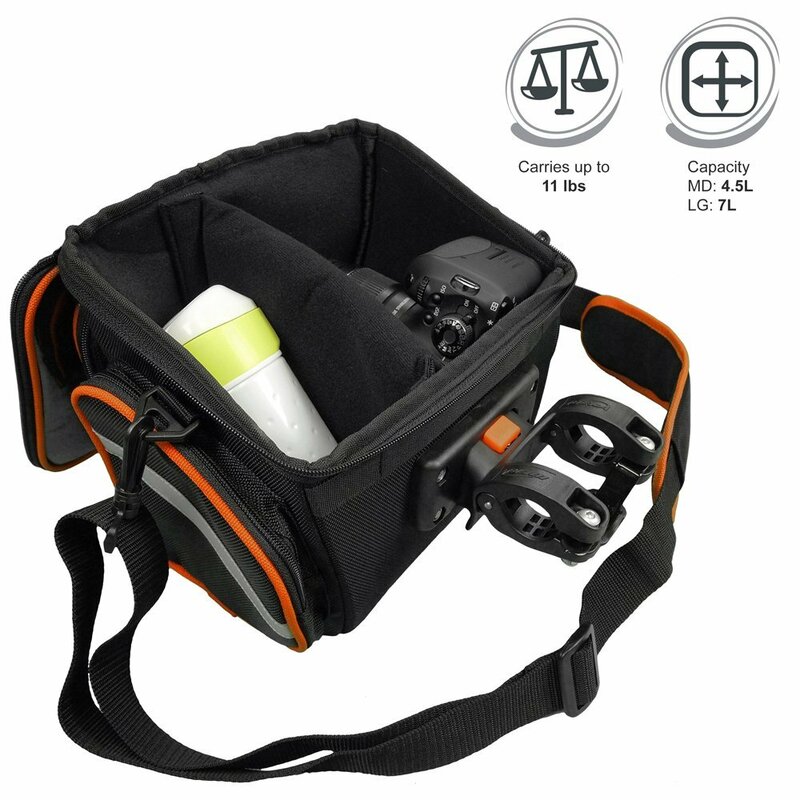 Of course, this bag is perfect for photographers, but the outsized compartments can be useful to anyone carrying bulky items. What are customers saying about the Ibera? As with the Roswheel bag discussed above, you’re bound to either love or hate the Ibera’s mounting hardware. Some users praise the “clip-on, clip-off” setup that allows you to mount and remove the bag with ease (it also comes with a strap so you can use it as a shoulder bag). Other users have noted that the clamps perform poorly on larger handlebars, even those within Ibera’s recommended size range. Again, you’ll want to test it on your bike rather than rely on the product specs alone. Users who were able to mount the bag successfully have reported that the bag does not interfere much (if at all) with brake cables. Finally, let’s take a look at the Topeak TourGuide Handlebar Bag DX. Topeak creates tools and accessories for every aspect of cycling, from bottle cages to computers, and they have enough awards and recognition to back up their claims of prolific innovation and high utility. Topeak’s TourGuide is the largest handlebar bag on our list—in fact, it’s the largest bag Topeak makes. At 10.6 x 10.5 x 8.5, it will devour whatever you put into it. This bag comes with a rain cover, so your goods are kept safe during wet rides. A reflective strip across the front keeps you visible in low-light conditions, and the clear pocket on top lets you consult your map or phone with ease. This is a bag for riders who are on expedition and need to carry a lot of stuff. 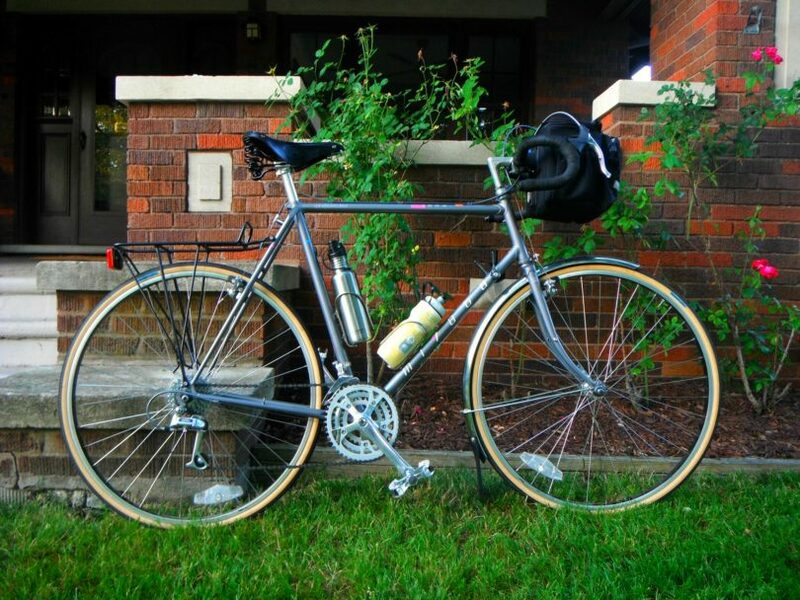 It’s meant for touring, after all, not a jaunt to your favorite ice cream stand and back. Whether you’re hauling delicate camera equipment or simply a bevy of smaller items, this large, well-padded bag can handle it all. What are customers saying about the Topeak? One user took this bag on a 550-mile trip down the California coast and found that it performed well, but you may have to be careful how you load the bag. Although this is a high-capacity bag, loading it to 11 pounds or more can cause the bag to shift or even cause the metal backing to bend slightly. Most other users have noted similar problems, but have found that a little experimentation and tinkering will eventually produce a secure, comfortable mount. Once you have that problem sorted, the various compartments and high-quality construction make this bag an attractive and useful tool for longer bike treks. Should I buy a handlebar bag for my bike? Handlebar bags may not be for everyone, but with their convenience and versatility, there are few reasons not to buy one if you have your heart set on it. Consider your bike first. 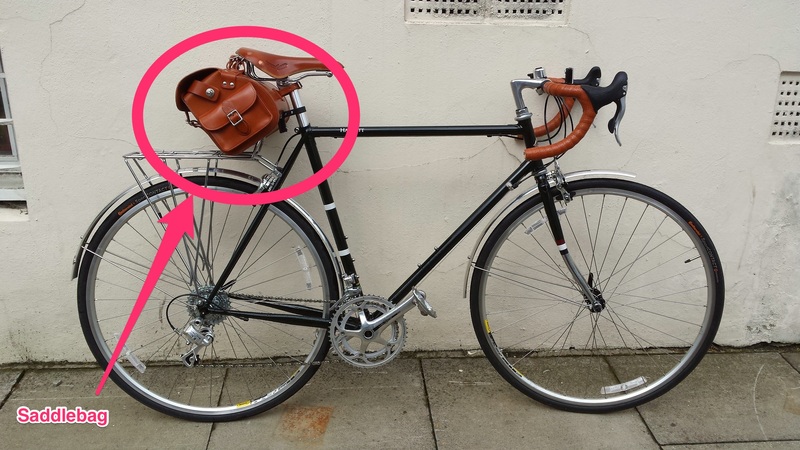 For example, if you have set of ﻿﻿bullhorn handlebar﻿﻿s the bag won't fit well. And if the bag throws off your handling, you might want to look at other options. The products I've highlighted here are specifically for touring, not for a slow roll around your block. Handlebar bags are convenient – There are plenty of options for on-bike storage, but only handlebar bags put the goods within arm’s reach. Most are designed to be unzipped or unsnapped as you ride so you can grab a protein bar or your sunglasses without breaking cadence. 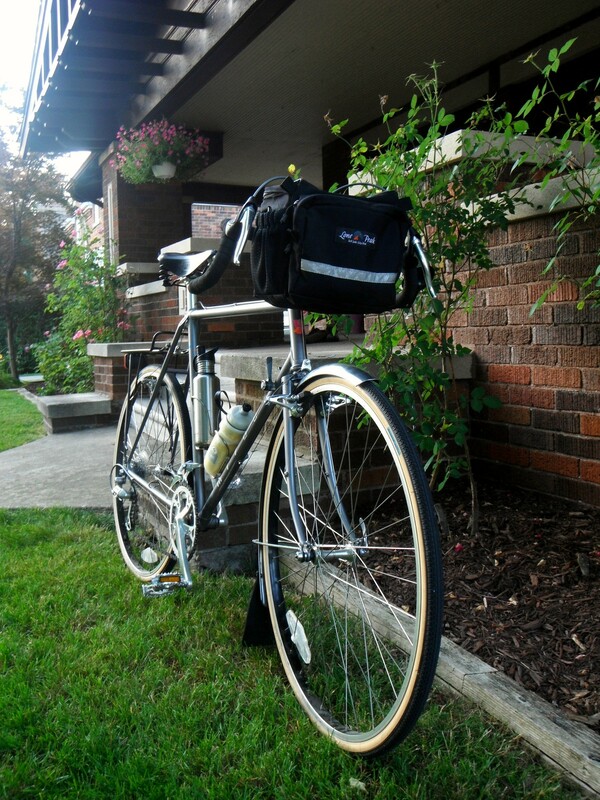 Handlebar bags are portable – Most handlebar bags are easy to attach and detach from your bike frame. Not only that, most come with special straps or handles that allow you to tote the bag around like a satchel or backpack. Handlebar bags require no special mountings or hardware – Handlebar bags are pretty self-contained. They come with everything you need to mount them, whether it’s Velcro straps or mounting clamps. You don’t need to install a cargo rack or look for mounting eyelets on the seat stays. 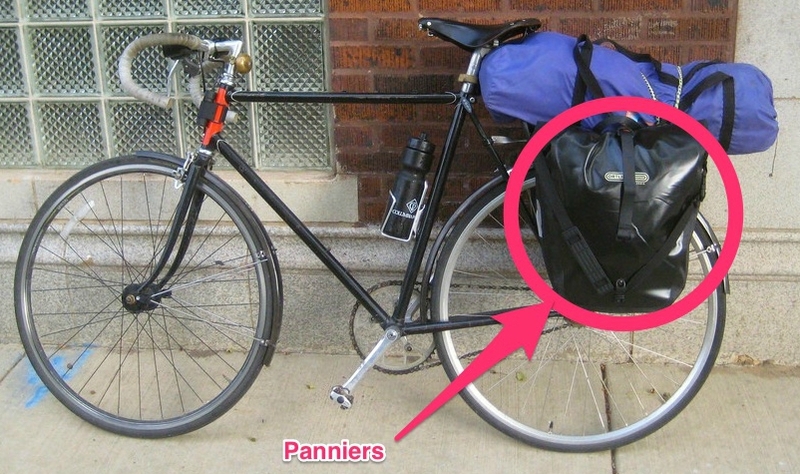 Panniers – These burly, high-capacity bags come in pairs and mount over your rear or front wheel, or both. When you need to carry a prodigious amount of stuff﻿ for an expedition, panniers turn your bike into a pack mule. Saddle bag – Maybe all you need to stash is your wallet and a pair of sunglasses. Saddle bags come in any size you want, as long as it’s small. They attach to your seat post and to the rails on the underside of your saddle, usually with Velcro or clips. Backpack – There’s an endless range of backpacks you could use, from your lightweight drawstring bag to an ordinary school backpack, but for biking, nothing beats a Camelbak. Each comes with a high-capacity bladder for water, a flexible straw you can drink from on the go, and plenty of storage space for anything from snacks to spare tubes to a U-lock. Saddle bags are a convenient, carry-all option when you have a fair amount of stuff to haul, and you want to be able to get at it without jumping off your bike. Unless you have very particular needs, the best pick from our list is the ﻿﻿Ibera All-Weather model. Its average size and modest cost make it a good middle-of-the-road option, and the waterproof cover and map case are a must for long bike rides.